We are a leading Manufacturer of air quality dust sensor and hb100 microwave doppler radar from Chennai, India. 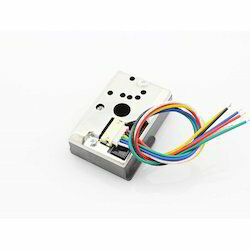 GP2Y1010AU0F is a dust sensor by optical sensing system. An infrared emitting diode (IRED) and an phototransistor are diagonally arranged into this device. It detects the reflected light of dust in air. Especially, it is effective to detect very fine particle like the smoke. In addition it can distinguish smoke from house dust by pulse pattern of output voltage. HB Series of microwave motion sensor module are X-Band Mono-static DRO Doppler transceiver front-end module. These modules are designed for movement detection, like intruder alarms, occupancy modules and other innovative ideas. The module consists of Dielectric Resonator Oscillator (DRO), microwave mixer and patch antenna. This Application Note highlights some important points when designing-in HB100 module. Most of the points are also applicable to other models in this series. Looking for Dust Sensor ?